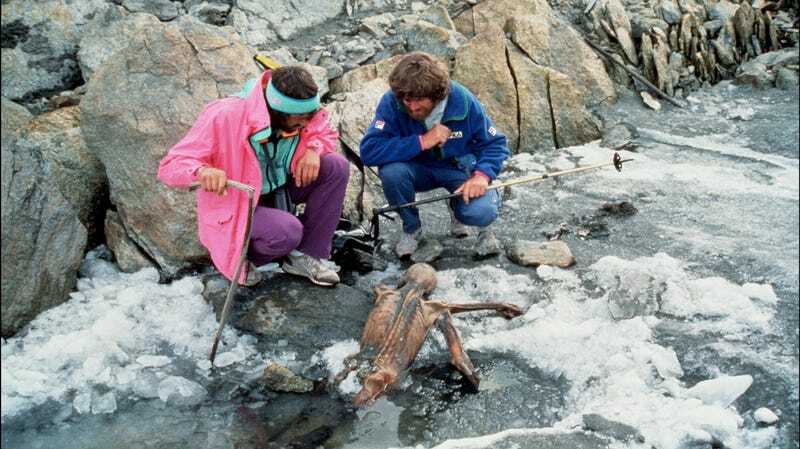 Two mountaineers with Otzi, Europe’s oldest natural human mummy, in the Otztal Alps between Austria and Italy in September 1991. Otzi (a.k.a. Oetzi) is a mummy that has been studied extensively at the Institute For Mummy Studies in Bolzano, Italy, after he was discovered in the Italian alps by a pair of climbers in the 1990s. Thirty years later, researchers now announce that they can reveal Otzi’s last meal, due to the remains in his stomach. The reason for the decades-long delay is that Otzi’s stomach got pushed up into his rib cage during the mummification process, so that these specific remains were overlooked until now. Frank Maixner, coordinator at the Institute For Mummy Studies (and I thought I had a cool job), tells NPR’s Alisa Chang that Otzi’s last meal was about what you’d expect: “It was obvious that a meal was high-fat in this case. And we saw also traces of animal and plant remains under the microscope.” The animal remains were traced back to “the ibex [and Alpine mountain goat] and to the red deer.” Maixner notes that it makes sense that a high-level climber in these conditions would concentrate on such a high-protein, high-fat meal, aligning with the outlines of the caveman paleo diet. The explorations of Otzi’s stomach remains is not over, though. Maixner reports that the next step is to examine his gut microbiomes to see what can be discovered there: “We think here it would be really interesting to see what bacteria are still present at this time since the diet quite substantially changed to our nowadays diet.” If you are lucky enough to travel to Bolzana, Italy, this summer, you can see Otzi’s remains for yourself, as he remains on display even as this research continues.